When the Travis Hafner Training Center campaign began in 2011 Union State Bank (USB) was one of the first organizations to pledge financial support. USB recently made its final $10,000 contribution on its $50,000 gift to mark the end of its financial commitments to that capital campaign. 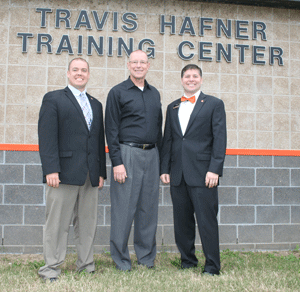 Their pledge secured the naming rights to the Travis Hafner Training Center’s weight room. Union State Bank has a long history of supporting the college as evidenced by previous financial pledges to the Brown Center and renovation of W.S. Scott Auditorium. “We understand the importance of Cowley College to the community and we want to do whatever we can to help support it in any way,” John Sturd, Union State Bank president said. Ben Schears, Cowley College vice president of institutional advancement, said the college can’t thank Union State Bank enough for their trust in the college and support of its work.